Why is a strange network of Twitter accounts, usually the source of pro-Russian messages, now pumping out tweets about a very specific British election? They number in the dozens and they are targeting the pro-Brexit UK Independence Party and in particular its leader, Paul Nuttall. This odd collection of Twitter accounts is obsessive. They co-ordinate their messages. 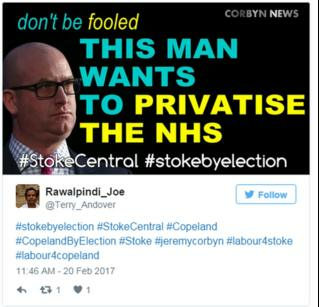 And they are also praising Labour leader Jeremy Corbyn ahead of Thursday's by-election in Stoke-on-Trent Central. There's no evidence that they are connected to Labour or any other political party, however. Nuttall, who was elected UKIP leader in November, is contesting the seat, which has traditionally been solid for Labour. There is of course nothing unusual about political messaging on Twitter - and these accounts don't have big numbers of followers or retweets - but the strange shift from pro-Russian to anti-UKIP messaging has caught people's attention. The network was initially uncovered by Alex King, an independent researcher who tweets as @GlasnostGone. King tracks Russian propaganda on social media and was an organiser of the campaign to free a Ukrainian pilot, Nadiya Savchenko, who was captured by pro-Russian forces battling in Ukraine in 2014. King noticed patterns that suggest the accounts are part of a co-ordinated campaign rather than driven by individual users. For instance, the accounts in question use stock pictures as profile images. In addition to the memes they litter their tweets with hashtags, apparently to try to influence the conversation around specific topics. Bots - automated Twitter accounts - pushing political messages tend to use more hashtags and push repetitive messages. Several of the accounts put out such messages almost exclusively until early February, when they started to include the anti-UKIP and pro-Labour tweets. It's difficult to tell who is behind the accounts or whether they are controlled by one person or several. BBC Trending sent messages to the accounts involved. None responded. Trending has also approached UKIP and Labour for comment, but neither party has yet responded.